Are you Tired of your stained Handrails and want Painted Handrails instead? If you are like many of our customers, you have oak handrails. Like some of our current customers you are tired of looking at these oak handrails. If you want to change the look and have Painted handrails- this blog is just for you. 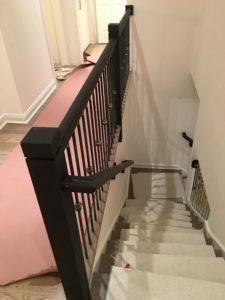 Here is why- you can Paint the Handrails and get the look you want in your home. And what happens if you fall into the “Don’t know” above excuses? You will look at that oak handrail for years to come. Our last customer, Karl, was getting his home remodeled with new carpet, stairs, floors, paint and wallpaper. The one item in the home they ignored because they didn’t think they could change-yep -painting their oak handrails. As you can see from some of the pictures, the solid oak handrails is ok- but the change is WOW! It all starts with cleaning and prep. We use a clean and deglossing agent to get rid of dirt, grime, cleaning products. Next, we lightly sand all the wooden surfaces. Once the primer is dry, we scuff sand and apply 2 coats the finish color. 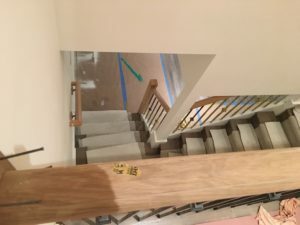 ” I never thought of painting our oak handrails. We have had these oak handrials for 25 years. I did not like the look of them, it looked dirty, felt dirty, and looked old. Dave and his team suggested painting the handrials, it was an easy yes. Dave and Spencer touched up our painted cabinets and painted all the walls and ceilings. 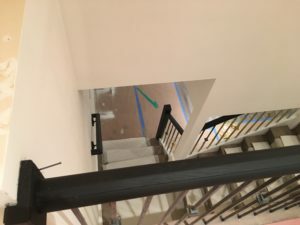 Painting those handrails really makes a huge difference not just how our home looks but how it feels” -Karl S.
Don’t worry about tearing out any handrails, not having a handrail, hiring a carpenter, a demolition crew, or selecting a type of wood for your handrail. Paint it, and enjoy! 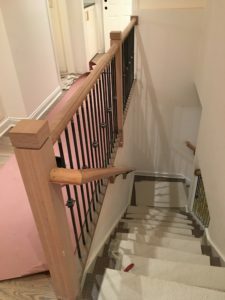 Do you want to keep the wood handrail you have? OR do you want to do have something new? We can help you update today!